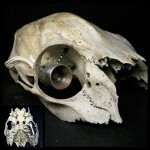 My good friend Yaron built this out of some stuff he had lying around the shop and what I’m guessing is a deer skull. I love the way the metal shavings (springs?) he mounted the socket on echo the sutures between the bone plates. Write your own microfiction for it below in the comments – anyone who’s listening. Don’t be shy.